The U.S. National Security Agency has taken a lot of flack this year from foreign governments, private citizens and tech companies alike, but not everyone thinks its actions are so far out of line. 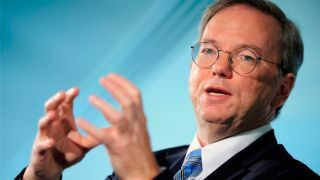 Google Executive Chairman Eric Schmidt took a neutral stance on the NSA's spying and surveillance practices this week, while also noting more public debate is to decide, "Is this what we want?" "There's been spying for years, there's been surveillance for years, and so forth, I'm not going to pass judgment on that, it's the nature of our society," he said at a New York event hosted by the New America Foundation. Schmidt is chairman of the Foundation's board of directors. Of course, some might disagree. While Schmidt's perspective may not sit well with some, Google is contributing to calls for greater transparency from the government regarding its surveillance programs and policies. Earlier this week, Yahoo joined Google and Microsoft in suing the Department of Justice for the right to disclose publicly how many national security-related information requests the government issues them. At the New York event, Schmidt emphasized that there needs to be more public discourse about the nature of the government's surveillance practices, but still expressed what sounds mostly like a pragmatic lack of surprise. He also reiterated that the NSA doesn't have direct access to Google's servers like some of the documents leaked by Edward Snowden seemed to indicate. Interestingly Schmidt said it's less the violation of privacy and more the threat to internet's global growth that worries him these days. "The real danger [from] the publicity about all of this is that other countries will begin to put very serious encryption – we use the term 'balkanization' in general – to essentially split the internet and that the internet's going to be much more country specific," he said. "That would be a very bad thing, it would really break the way the internet works, and I think that's what I worry about," he continued. Schmidt said earlier this year that it's in Google's best interest to protect its users' privacy. Is Prism something to fear?